Matt Wilkinson makes the daring step for a biologist of quoting (or, rather, misquoting as we'll see later) Rutherford's famous put-down 'all science is either physics or stamp collecting'. But this risk fits well with Wilkinson's entertaining and bravura style in attempting and largely succeeding in persuading the reader that the biggest shaping factor of many living organisms, including humans, is the ability to move, with all the benefits and costs this brings. One of the delights for the reader are the number of surprises along the way. In some cases it's something that really should be obvious, but probably never occurred to us - such as the way the basic shape of many organisms with, for example, a mouth at the front has been shaped by the nature of movement. Or the linkage of brain and movement. Wilkinson effortlessly takes us through the differences between walking and running in humans or the various ways that flying has evolved in different species, noting that there now seems reasonable evidence that even though birds mostly don't need to drop from a tree to start flight, their ancestors probably did. Let's get that misquote out of the way. Wilkinson has Rutherford say 'physics is the only science; all else is stamp collecting.' That change of wording makes it easy to misunderstand Rutherford's intent, which was to highlight that most of science outside of physics was about collecting and organising information, rather than using induction to derive laws and meaning. He didn't say the rest wasn't science, just that it was a different (and by implication lesser) part. Wilkinson goes on to suggest that Rutherford implied that nature was unruly and opaque to order - but that was clearly not Rutherford's intent; his comment was about what scientists did, not about the fields per se. While we're in the negative, the only reason I didn't give Restless Creatures an effortless five stars was inconsistency. The best chapters are some of the most outstanding science writing I've read this year and I loved them. This comes out, perhaps not surprisingly, in a fascinating exploration of why we have our upright two-legged gait - but also, for example, in a wonderful chapter on a part of the natural world we tend not to associate with movement - plants. Yet as Wilkinson shows, not only are there exceptions like the venus fly trap, most plants make use of movement (sometimes with the motive power provided cunningly by other organisms) to spread their seed and avoid everything happening in the same place. However, there were a few places where the writing lost its impetus and became a little turgid. This tended to happen, funnily, when physics came into the story - the explanations of the mechanics of movement, for example with a bird's wing, were hard to digest, while the chapter 'A Winning Formula' on the detailed mechanisms involved in producing a biological form was by far the least readable. Even if you feel the urge to skip those parts, though, the rest of the book is so well worth it that I very much enjoyed it. 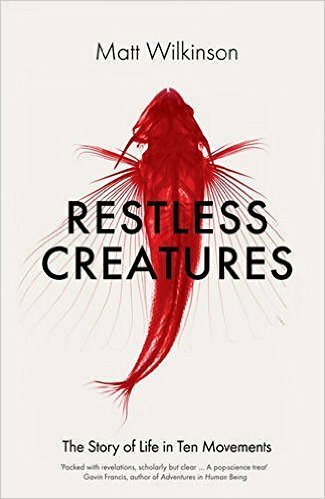 Wilkinson takes a new, refreshing look at the nature of living things, particularly animals, and convinces even the most sceptical reader of the importance of locomotion to both the form those animals take and their remarkable range and variety. For this reason, I can heartily recommend adding this book to your collection.